The vast altar of the Pavilion was transformed again for the empowerment of the Three Roots Combined. In the center was placed the great throne covered in brilliant gold over ornate carvings: on the back panel, a radiant Tsepakme (Amitayus, the central figure of today’s empowerment) would sit just above the Karmapa’s head like his crown ornament while two elegant peacocks with long flowing tails supported the table in front of him. Behind and perfectly aligned with the throne was the new statue of the Buddha; the two were linked by a series of huge formal bouquets in saffron, pale yellow, gold, and the accents of deep red. For the preparation, the Karmapa sat at stage right, hidden behind a four-panel folding screen painted on both sides with the four bold kings, protectors of each direction. The sangha chanted the Twenty-One Praises of Tara and Karmapa Khyenno (Karmapa, you know me) as the Karmapa’s bell rang through their voices. The Karmapa was facing a golden shrine of rooves undulating in the four directions and strings of bells extending from the central peak. Around the base of the shrine were deep green and gold medallions depicting the eight auspicious symbols, and in between, on the shrine proper were the usual seven offerings of water for drinking and water for bathing, flowers, incense, perfume, food, and music with a butter lamp set in the middle and just above it, glistened a generous kapala skull cup. Appearing above it on the far side of this miniature pavilion was a new thangka of the Three Roots Combined. Preceded by jaling horns and elaborate incense holders, the Karmapa and his retinue entered the Pavilion hall. After making his bows, the Karmapa took his seat on the central throne while on stage left, sat the tulkus (reincarnate lamas), including Jamgon Kongtrul Rinpoche, Goshir Gyaltsap Rinpoche, Yongye Mingyur Rinpoche, and the young Bokar Rinpoche, who was discovered in Sikkim during last year’s Kagyu Monlam. Standing to the right of the Karmapa’s throne throughout the ceremony were two monks in rich brocades, who held ornate incense burners. Once the vajra tent had been created in the ritual, the Karmapa paused to offer an explanation of the Three Roots combined and its significance for his lineage. First he commented that this practice is special and exceptionally profound; it belongs to the Karma Kamtsang and in particular, to the Karmapa, and has both a long and a short lineage. The short lineage, he noted, is traced back to a text based on the pure visions of the Third Karmapa Rangjung Dorje (1284–1339). The Eighth Karmapa Mikyo Dorje (1507–1554) also practiced the Three Roots Combined and stated that through it, “especially pure visions and dreams appeared in my experiential awareness.” Mikyo Dorje expanded the practice, the Karmapa commented, by adding an empowerment and completion stage practice from the texts of past realized masters. Then the Ninth Karmapa Wangchuk Dorje (1556–1603) created an extensive sadhana by supplementing Kamtsang practices with those from the Nyingma tradition. The Karmapa continued to explain that later, the treasure revealer Choje Lingpa (1682–1725) discovered a ritual of the Three Roots Combined that presented the same deities and mantras as those in the Kamtsang tradition. So the two traditions flowed together as one and, he said, it was this newer tradition that the Kamtsang masters came to use. Their own tradition became nearly extinct and the text was difficult to find. To revive the tradition, therefore, Jamgon Kongtrul Lodro Thaye (1813–1899) included the lineages of the empowerment and reading transmission in his Treasury of Precious Terma. The Karmapa added that he himself had received these empowerments from Gyaltsap Rinpoche, and during the hundreds of initiations, it was this one of the Three Roots Combined that gave him a special feeling. 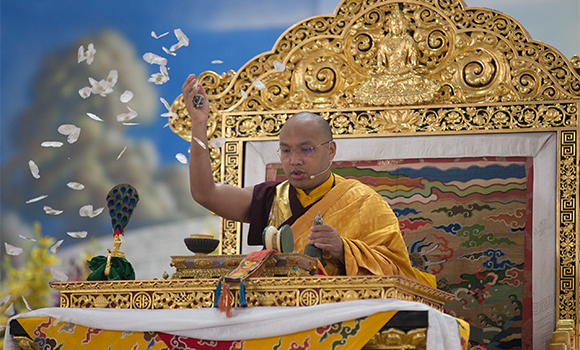 The Karmapa added, “Since the Three Roots Combined constitute an exceptional and profound text of the Karmapa’s tradition, I’ve taken a particular interest in it and made efforts to find the old texts.” The Karmapa said that he had not found the root text from the Third Karmapa, but had discover the Eighth Karmapa’s text for the empowerment and the sadhana’s completion stage practice. This took some searching as the Three Roots Combined was listed in the table of contents of Mikyo Dorje’s collected works published in Tibet, but the actual text was not there, the Karmapa said. The third text he found was a precious commentary on the Three Roots Combined by the Fourth Goshir Gyaltsap Drakpa Dondrup (1547–1613); the fourth text was an old one of the extensive practice, created by the Ninth Karmapa. So now almost all the texts are complete. In general, the Karmapa explained, it is said that if the three roots are combined into one mandala, this is the practice of Gyalwa Gyatso (Jinasagara); if they are combined into one body (kaya), that is Tsepakme (Amitayus). In terms of the yidam deity, the physical aspect is Tsepakme; the color of red represents Pemajunge (Padmasambhava); and the emblems of the curved knife and the skull cup represent Dorje Naljorma (Vajra Yogini). Of the three faces, the Karmapa continued, the right one is white, and this along with the lotus on a stem and the lotus garland represent the embodiment of great compassion, Gyalwa Gyatso. Amitayus’ left face is black and represents the Dharma protector Mahakala. The Karmapa summarized saying that in brief, the aspect of the lama is Tsepakme; the aspect of the yidam is the great compassionate one, Gyalwa Gyatso; and the aspect of the Dharma protector is the wisdom protector Mahakala, so all the three roots are complete in this one form. So one could say that if we were given this empowerment, it would be similar to receiving the empowerments for all the lamas, yidams, and Dharma protectors. Mikyo Dorje stated, therefore, that even if you have not received other empowerments, with this single one you will be able to care for and guide students. The Karmapa added here that Mikyo Dorje gave this long-life practice another name, “Not a Lie” because it arose from a pure vision. After proceeding along with the empowerment, the Karmapa paused to talk about the special long-life pills (tseril) that had been especially prepared for this day. Blended into them are long life substances prepared at the time of the Sixteenth Karmapa. Usually the long-life pills are fashioned on the day of the empowerment, but unusual care has been taken with these. The tseril were passed out to everyone in small maroon envelopes with a golden HRI emblazoned on the front and on the back, the explanation: “Long Life Pills from the Sacred Objects of the Great Encampment,” (another name for the residence of the Karmapa). The Karmapa also explained that the long-life water for this empowerment was exceptional as well and told the following story. After the passing of Qubilai Khan (Kublai Khan in popular writing), who was the founder of China’s Yuan dynasty (1271–1368), the next ten rulers all died in their 40s. During the Third Karmapa Rangjung Dorje’s lifetime, there were three khans, the third of whom, Toghan Temür (reigned 1333–1370), invited the Karmapa for a second visit to China. The Karmapa had discovered a long-life spring at Samye Chimpu—a sacred site of caves in central Tibet where Guru Rinpoche practiced with his twenty-five close disciples—and brought some of the water with him when he went to China. When Rangjung Dorje bestowed a private long-life empowerment on Toghan Temür, he gave the khan this long-life water, which added thirty-seven years to his life and made him the longest lived of all the Yuan emperors. Through an auspicious coincidence, recently some of this long-life water had been brought from Samye Chimpu and offered to the Karmapa, who added it to the long-life water for today’s empowerment. The occasion is thus doubly auspicious for this specially blessed water from the Third Karmapa’s spring in Tibet, and also for the fact that the Third Karmapa was also the one who created the original text for the Three Roots Combined in the short lineage. Recalling the end of the Knowing One Frees All empowerments last year, the Karmapa said he would again pass through the long rows of nearly eight thousand disciples and personally give everyone a blessing. He commented that the practice of placing a vase on the head and partaking of its nectar were not a part of empowerments in the more distant past. This is a custom that developed later, he said, to put people’s minds at ease. Perhaps it gave them the feeling that they had actually received the empowerment. So the Karmapa descended from the golden throne, and ringing a bell with his left hand and carrying a vase with in his right, he first blessed those on stage (the tulkus, khenpos, and translators), and then moved down to the vast floor of the Pavilion. Here he passed up and down the double lines of disciples, the sound of his bell getting fainter and louder as he blessed row after row of the fortunate participants. Almost an hour later, he came back to the enclosure on the side of the stage to conclude the empowerment. From the delighted smiles on people’s faces, there was no doubt that they had received the blessing of this special initiation—an event that formed part of the Karmapa’s sustained efforts in renewing the roots of his hallowed tradition.